How many times in the U.S. have you seen a female “waste management specialist” or just a trashman? I mean, I’ve never even heard the word trashwoman let alone seen a woman driving the truck or hauling the bags. Now, that’s not to say that they don’t exist; I’m sure you could find one or two here or there. But, in Rome, and much of Europe for that matter, equality of the sexes is not limited to just the water cooler (white collar work). So, let’s take a look at two very fine examples of European equality amongst the sexes! Here is a photo taken in front of the Trevi fountain in Rome. Not only are these females trash’men’ but they are attractive. Let me repeat this, these trash’women’ are ATTRACTIVE. That is something that I’m pretty sure is impossible, no matter what, to find in the U.S. These women are fully dolled-up with their hair done, make-up, earrings, the works. The only thing that seems out of place, from what one would expect given their looks, is the bright orange jumpsuit. So, the next time someone talks about not having enough women in the workforce, point them to this article and let them know they have a chance ;P – just kidding. 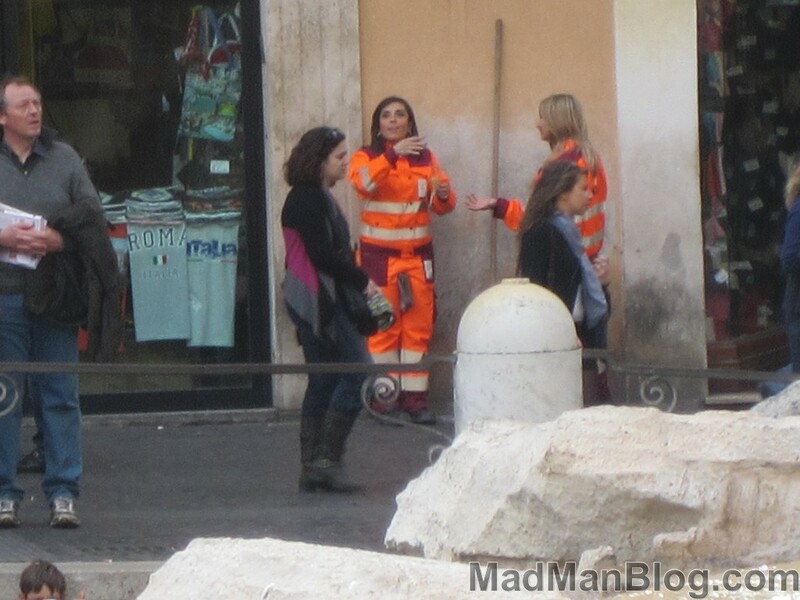 But really, this does point to a big difference between the sexes from Europe to the U.S.
As a last word, all I have to say is that, if ‘waste management specialists’ looked like this in the U.S. , I would be putting the garbage out all the time! And without being yelled at to do it :).